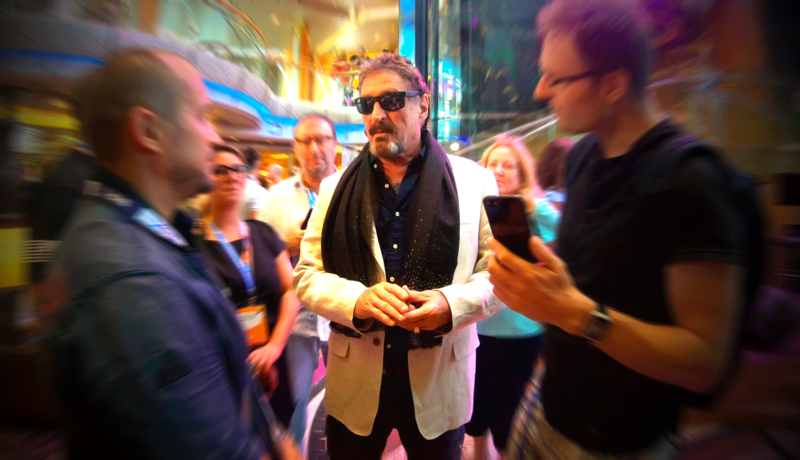 John McAfee Greets Fans In the Blockchain Cruise Lobby. Over the years, I’ve read the rumors and seen the onslaught of headlines surrounding the cybersecurity legend, John McAfee. From launching tech startups, to authorities believing he was culpable for a murder in Belize, to evading tax payments to the IRS for 8 years, to fathering 49 kids – a story that curiously resembled Vince Vaughn’s Delivery Man. Turns out, the IRS gossip was factual; But, hey, the internet is bound to churn out the truth every once in a while. The fierce Libertarian took to the Twittersphere to verify the accusations, accompanied by a statement saying taxation is illegal. While most of us would advise the antivirus pioneer that taunting the IRS on social media is a recipe for disaster, John McAfee just doesn’t give a F**k.
I was first introduced to McAfee during a Blockchain gathering on a Mediterranean cruise. McAfee was the celebrity headliner; the high-profile guest speaker that everyone aboard the ship clamored to get a glimpse of. The Crypto junkies were like a human stampede, all wrestling for the opportunity to snap a selfie with the handsome man, who was adorned in a crisp white suit, matching silk scarf, and aviator sunglasses. To be victorious, however, you had to make it past the judging eyes of his security detail. This wasn’t simply surviving the scrutiny of The eyes of Doctor T. J. Eckleburg; this was a team of former Army Ranger Snipers and Special Ops soldiers. McAfee made sure everyone knew that they were fully equipped with a horde of concealed weapons. I have to admit, I felt rather nervous about meeting him. After all, my expectations of him were built upon a bunch of chaotic stories that littered the internet. Imagine my surprise when I discovered he was one of the most gracious, kind, and charming individuals I had met in a long time. When I received a message from Janice regarding the interview with McAfee, I was floored. Not only did the McAfees stay true to their word, but they invited us to their home for our Adventures In Crypto interview! 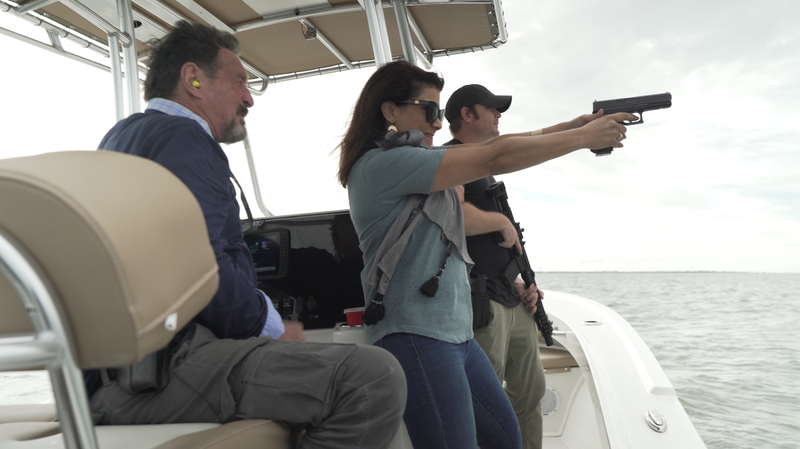 Screw the 20-minute sit down on the cruise, we were about to experience a day in the life of John McAfee, which, to be frank, mainly consists of crypto, cocktails, and firearms. When our crew’s caravan arrived at his east coast home on an undisclosed island, we were greeted by the same (intimidating) security team we encountered on the ship. This time, however, the pistols strapped to everyone’s legs were in clear sight, along with the semi-automatic weapons that were being held at the ready. Oh, and there were dogs. Lots of big, ferocious-looking dogs. Minutes after unloading our equipment, McAfee insisted on feeding me some booze. “Have you ever had an espresso martini?” He asked. I hadn’t. 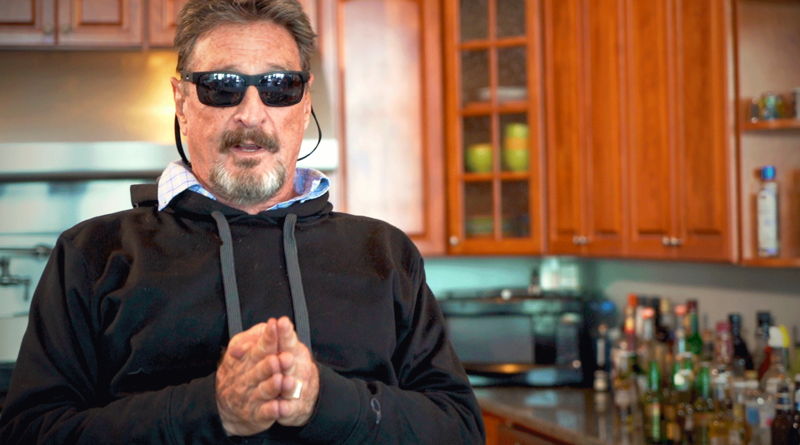 If you follow McAfee on Twitter, then you know all about his ‘Mixology 101’ videos. Day after day, John uses his inventive imagination to brew up some tasty new cocktails, later posting videos of how to make his original concoctions on social media. Pouring my espresso martini into the long-stemmed glass, he gave me an inquisitive look and asked if I planned to actually drink the expertly crafted beverage. Why? Because he doesn’t make drinks just for them to be wasted. There was no humor in his voice, he was as serious as a heart attack. So, I thought to myself, now would be the perfect opportunity to ask the gun enthusiast if he’d be willing to show us his shooting skills. After all, not only was everyone holding a gun, but his house was pretty much a firearm-themed museum. Boy did his eyes light up! He ushered us into his boat, driving out to sea to put his talent on display. Meanwhile, I was still slowly sipping my espresso martini. In an effort not to waste McAfee’s time (or alcohol), he graciously poured it into a solo cup for me, so it could accompany me on our journey into the deep blue. I frequented my local shooting range in the past, taking lessons on how to properly use my 9mm handgun. Once we reached a safe spot to shoot, and the semi-automatic guns came out to play, however, I had no idea what I was in for. Their thunderous noise was pure power and I could feel the force of it just standing in the vicinity. The experience was intense; yet, for John and his wife, it was just another day in the McAfee universe. We hightailed it back to the house, causing water to dampen our once dry clothes and my crew to seize hold of their gear as if it could barrel into the depths of the sea at any moment. 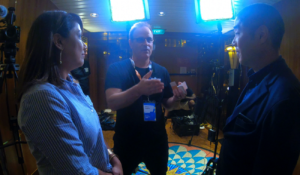 As McAfee and I began talking, we broached the subject of how blockchain and crypto can have an enormous impact on life as we know it. We immediately dove into the implications it will have in the very near future on our privacy, power, and wealth. Once we were back on dry land, McAfee offered up some of his deeper, thought-provoking, and somewhat alarmist viewpoints on what he believes lies ahead for us. His comments weren’t expressed in an effort to gain attention or make new headlines. His convictions were genuine. We continued to chat over hamburgers and, of course, some boozy beverages. People have tried to define who or what John McAfee is. It’s as if his critics, and even his allies, feel the need to categorize him, just for the sake of their own comfort. There are strong opinions of him on both sides of the equation, but you know what the best part about that is? He knows he’s loved and hated by many, confessing that there are people across the globe who would love nothing more than to see him dead – but that doesn’t discourage or intimidate him. Whatever your opinion of him may be, here’s one thing I can tell you for certain: He’s passionate. His beliefs surrounding blockchain technology, cryptocurrency, and their power to dramatically alter our lives, is deeply ingrained in his very core. He’s so convinced of the future of crypto and bitcoin that his entire platform for his 2020 presidential bid is rooted in these two disruptors. That’s it. He openly admits that he doesn’t want the burden of being president. His campaign even encourages individuals NOT to vote for him. Instead, he wants to use this time in the spotlight, entering into the political fray, just to make sure he able to do his part in educating the American population on this new technology and way of life. And if there’s anything John McAfee loves besides his beautiful wife, it’s disruption. John McAfee During His Discussion About Privacy, Cryptocurrency, and Governments. Elsa Tries Her Hand At Firing One Of John McAfee's Pistols.